Nudibranchs are members of the mollusc family; basically they’re snails without a shell. Nudibranchs are characterised by soft bodies with bright colours and striking patterns to deter predators. They are often called sea slugs. There are more than 3000 species of nudibranchs worldwide! Adults are from 2 to 60 centimetres in length. Nudibranchs have chemical sensors called rhinophores on their head which they use to smell and taste chemicals in the water to help them find food. 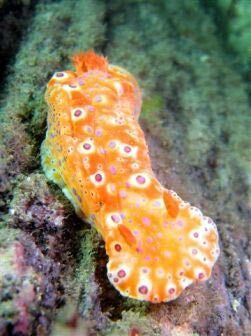 Most nudibranchs are carnivores, feeding on sponges, hydroids, bryozoans, other sea slug species, or, occasionally they are cannibalistic and prey on members of their own species. Other groups feed on tunicates, barnacles, or anemones. Nudibranchs are hermaphrodites with a set of male and female reproductive organs.